On this day in dinosaurs the “Great Tyrant from Zhucheng”–a Chinese city in the Shandong Province–was described for the first time. At more than a dozen feet tall and nearly 40 feet long, Zhuchengtyrannus was the 5th largest carnivorous theropod when it was described in 2011. Weighing in at 13,000 pounds, Zhuchengtyrannus was certainly no lightweight. The remains of Zhuchengtyrannus, and other dinosaurs, were fortuitously found by a construction crew. They were excavating an area for a new museum dedicated to fossil discoveries and made some finds themselves! You never know when you’ll find more dinosaurs. 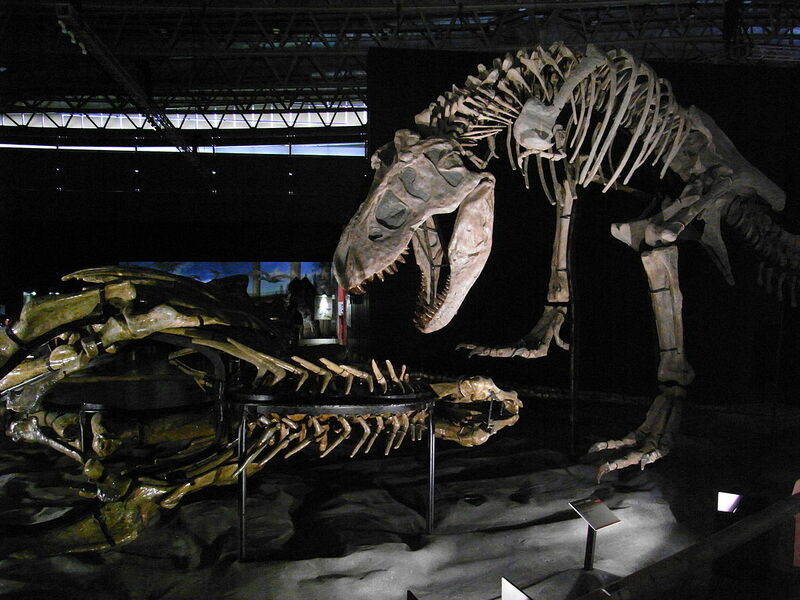 Share your favorite tyrannosaur photos with us on Facebook and Twitter using the hashtag #TDIDinos. On this day in dinosaurs, some Mesozoic favorites roared onto IMAX screens in three dimensions. Dinosaurs Alive is a 40 minute jaunt around the world and back in time to learn more about the world as it once was. 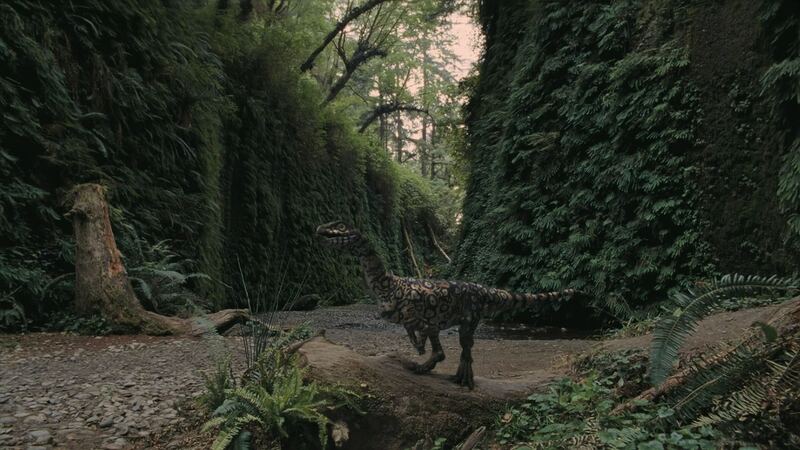 The CGI dinosaurs duel and dance while scientists pursue their fossils around the globe. *Please Note: The trailer narration says dinosaurs existed “60 million years ago” which is inaccurate in reference to non-avian dinosaurs which went extinct 66 million years ago. Not to be “that guy” but it’s important enough to merit mentioning. Share your favorite memories from Dinosaurs Alive and other prehistoric specials with us on Facebook and Twitter using the hashtag #TDIDinos. On this day in dinosaurs, William Holland, Director of Pittsburgh’s Carnegie Museum of Natural History was in New York City ahead of one of the biggest coups in paleontological history. Holland was meeting with his benefactor, Andrew Carnegie, about their difficulties in securing a giant dinosaur for the museum. They spent the afternoon at the American Museum of Natural History with Jacob Wortman. The objective of the visit was to gain insights into the American Museum’s Department of Vertebrate Paleontology. But Holland was both impressed and fascinated by the work of Wortman and collector William Reed. Within several months of this visit to New York, Holland recruited Wortman, Reed, and Arthur Coggeshall–a skilled fossil preparator–to join him in Pittsburgh. This power shift gave Carnegie and the Carnegie Museum the talent and determination they needed to build their own vertebrate paleontology division. This dream team would be the foundation for an institution that would unearth some of the most dramatic and globally recognized dinosaurs in the world. And it all began with a little trip to the American Museum on this day in 1899. Although Gorgo is more of a monster than a dinosaur, and not a true Gorgosaurus, we felt it necessary to celebrate the release of the classic film today. Share your photos of the Carnegie Museum’s dinosaurs and Gorgo with us on Facebook and Twitter using the hashtag #TDIDinos. 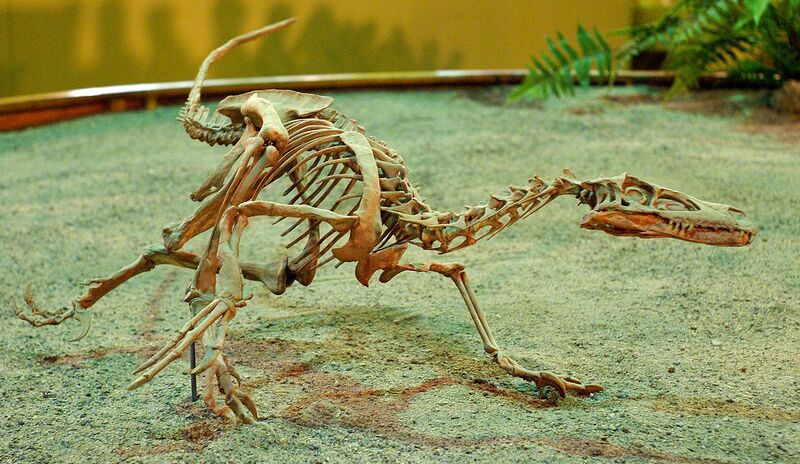 They’re terrifying enough in broad daylight, but were some dinosaurs nocturnal? A study in 2011 tried to answer that question, which seemed like a riddle that couldn’t be answered through skeletal data. That is, until scientists started looking into dinosaur eyes. Unlike mammals, archosaurs (a group that includes dinosaurs, along with crocodiles and birds) have a ring of bone in their eye sockets called the scleral ring. This gives an indication of the size of a dinosaur’s eye. Since fossilized soft tissue is rarely found, scleral rings give us a window into Mesozoic irises. The size of an animal’s eyes can provide clues to its habits. Modern animals with large eyes often live in low-light environments or have adopted a nocturnal lifestyle. Larger eyes capture more light, which makes seeing in the dark easier. Examining modern nocturnal animals, scientists found that a large pupil in relation to the retina was indicative of operating in dark conditions. Using the scleral rings to determine the size of the eye in relation to a dinosaur’s eye socket, scientists hoped to determine whether the ancient creatures could operate at night. So were dinosaurs confined to the daylight? Research suggests that they might not have been restricted to living in the sunshine. Comparing 33 Mesozoic archosaur species with 1401 living species from many animal groups revealed that dinosaurs were not uniform in their optical equipment. Based on this data, researchers concluded that animals like Velociraptor and Microraptor could have been partially nocturnal. Psittacosaurus and the giant Diplodocus seemed ready for both day and night time behaviors, like many of today’s animals. Whether these conclusions are accurate or merely plausible, the idea of packs of raptors hunting in the darkness is bone-chilling. Share your fascinations and fears about nocturnal dinosaurs with us on Facebook and Twitter using the hashtag #TDIDinos. On this day in dinosaurs, an icon took center stage at Chicago’s Field Museum of Natural History. 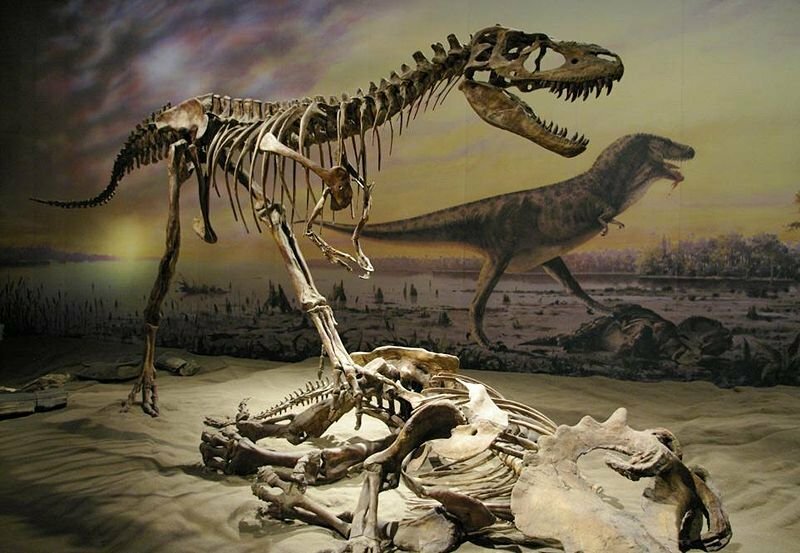 “Gorgeous George”–a Gorgosaurus, which is now classified as Daspletosaurus–held this position of honor in Stanley Field Hall for three decades before making way for the museum’s Brachiosaurus, which would itself make way for Sue the Tyrannosaurus rex. But today is all about George, who still graces the Field Museum’s Evolving Planet exhibit, albeit in a much more anatomically correct pose. 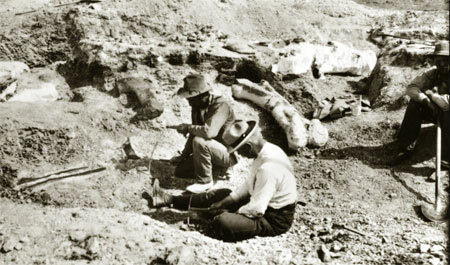 George’s bones were found in 1914 by Barnum Brown and brought to the American Museum of Natural History. 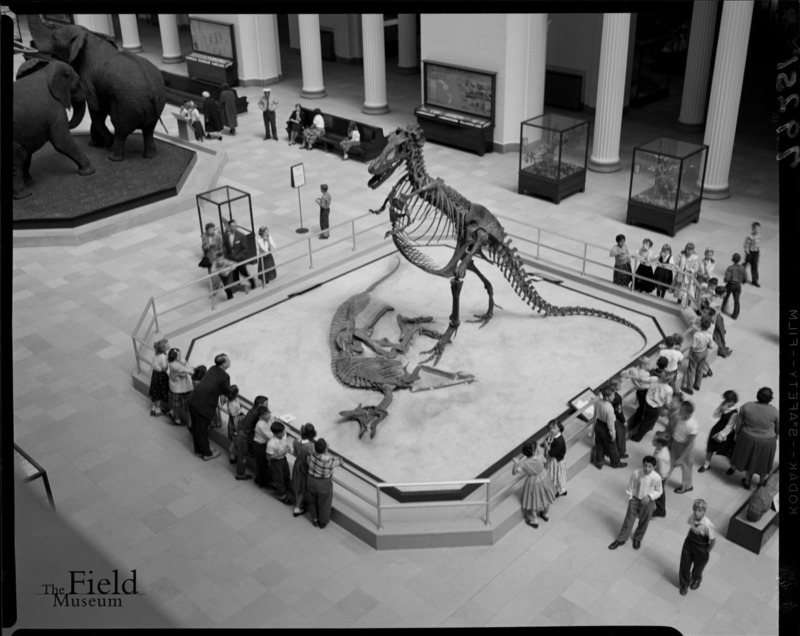 In 1955, the Field Museum purchased the dinosaur for the purpose of constructing a dramatic display piece. Museum staff mounted the real bones using a metal armature so that the support structure for the fossils could not be seen. This involved breaking some of the bones, but at the time, this act of desecration didn’t bother the team. They were after a visual feast, rather than a research specimen. At 26 feet long and 15 feet tall, Gorgosaurus/Daspletosaurus was an impressive addition to the Field Museum’s central space. The specimen was unveiled with much fanfare in 1956. Stanley Field and Edwin Colbert from the American Museum of Natural History spoke about the dinosaur and it became a beguiling sight for visitors. Though the mount has changed, it continues to inspire awe in its new home on the museum’s second floor. Do you have pictures with Gorgeous George? Share them with us on Facebook and Twitter using the hashtag #TDIDinos. Hearing the dulcet tones of Fritz Weaver uttering the words “But all things must die” changes your view of life. That’s what happened to me while watching an episode of The Infinite Voyahe called “The Great Dinosaur Hunt.” I was four years old. And then Stephen Jay Gould talked about how there’s no shame in extinction, how 99% of every species that has ever existed is gone forever, how the dinosaurs died out not because they were inferior but because of accidents and catastrophes. The mammals who survived the end Cretaceous extinction event weren’t any better than the dinosaurs–they were just better equipped to deal with sudden and dramatic environmental changes. Thus the book of life on earth opened for me. And more than that, I gained perspective on my own existence. If the dinosaurs died, I would someday as well. Not really uplifting bedtime story material. But illuminating nonetheless. I became both fascinated and terrified by death–as many, if not most, of us do. But dinosaurs seemed to provide a cautionary warning to Homo sapiens. If they could survive for nearly more than 150 million years, with descendants persisting into the present and flourishing, how foolish our species seems to struggle to achieve a fraction of that timespan. Whether through mistake or malice, we can destroy ourselves–and many of the other species on the planet along with us. No other singular species has ever had the power, or the strange inclination, to behave as we do. These impulses led Carl Sagan, in Cosmos, to muse about the willingness of other hypothetical civilizations on other worlds and how they might go through similar struggles. Some, inevitably, would not survive the exhaustion of their resources or their lust for warfare. But some might rise above their pettiness. As humans, we hope to continue on. Can we ever persist as long as the dinosaurs? Though many different dinosaur species rose and fell throughout the Mesozoic, the family persisted. But with our increasingly knowledge of biology and medicine, are we tampering with the forces controlling the development of our own species? Undoubtedly,the answer is yes, but what can we do about the future? And, even more pressing, what can we do about the present? Dinosaurs–and the fossil record in general–give us fundamental and critical insight into the workings of our planet’s biosphere over hundreds of millions of years. These clues speak to the same unequivocal truths that face our species now: too much greenhouse gas in the atmosphere will cause a devastating change in the climate, extinctions of too many parts of the food web result in its collapse, extinction on a global level does not affect only certain species–it affects them all. And, perhaps most ominously, we also have learned that we need to watch the skies. We must be prepared to deal with asteroids that could wipe out our civilization, along with other threats from other cosmic phenomena like solar flares. Cultural views and attitudes change with frightening rapidity, especially in our technologically expedient age. But we are now at the precipice of ecological destruction caused by our own actions. Will we heed the warning of the dinosaurs or plunge into our own permanent oblivion? Share your thoughts on extinction with us on Facebook and Twitter using the hashtag #TDIDinos. Non-avian dinosaurs don’t exist anymore. And while our feathered contemporaries inspire their own sense of insatiable wonder, we will not see living dinosaur giants in our short sojourn on planet Earth. Yet, these mysterious creatures live on in our culture–moreso than any other prehistoric animals. Dinosaurs have become something more than animals. They are beyond nature, beyond myth, beyond monsters. They are all of these and yet none of them individually. Dinosaurs have been resurrected by us–not in a literal, Jurassic Park way, or in the still-distant and slightly peculiar retrofitted chicken way. We infuse those old bones with art, and movies, and music, and memories and recreate dinosaurs within our imaginations. Each one of us has a distinctly unique vision of them, as individual as our fingerprints. And because we perform this miraculous reconstruction of ancient life, and because we love the dinosaurs we’ve each created in our own minds, the Mesozoic megafauna transcends extinction. Dinosaurs live on, both as living birds and as humanity’s favorite creatures from the past. They proliferate in our cerebral recesses. Inside our brains their calls echo through eternity. Because of us, they dance, duel, and die again. We want to know what you think about dinosaurs and why our fascinations with the extinct creatures persist. Share your thoughts and favorite dinosaur photos with us on Facebook and Twitter using the hashtag #TDIDinos.